SILVER SPRING, Md. 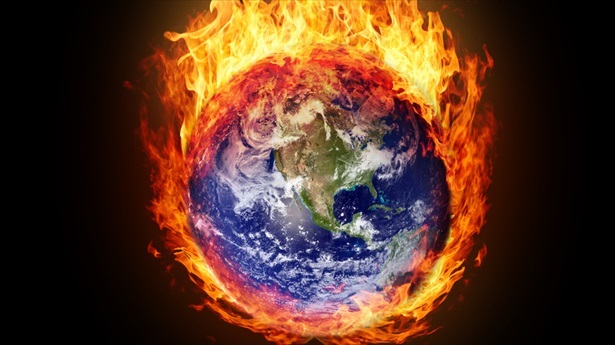 --- Environmentally-conscious Adventists were shocked today as the General Conference released a statement on global warming stating that "environmental conservation and green energy efforts, while cute, are ultimately pointless as the whole world is going to burn anyway." The announcement immediately provoked an outcry from progressive Adventists who decried the short-timer outlook of current GC administrators. "In their ardour to stress the hereafter, Adventist leaders are allowing the world to go to hell," said Andrews University-based Renewable Energy professor, Paward Greenely. "We as Seventh-day Adventists believe the Second Coming is soon but it seems very self-serving to therefore ignore any real efforts at stewardship in the meantime," said Greenely. "It doesn't imply a lack of faith to show a little concern for the world around us. We would have a lot more credibility as a church if we'd been a little less blinkered over the last 150 years plus." General Conference officials have yet to respond to Greenley's comments. They are said to be in round-the-clock meetings aimed at how to best utilize offering money to dump landfill loads of tracts and paperbacks on the doorsteps of complete strangers in major cities around the world. Where Single Adventists meet. Free 2 year membership. Divorced, widowed, and never married welcomed. We want Adventists to meet other Adventists. Elon Musk has just agreed to launch a 2016 special SpaceX rocket mission to Mars (prior to the inferno) with a copy of Great Controversy on board to so it can be eternally preserved and then copied there and handed to all the Martians. However, he is concerned that once the world catches on fire all the copies of that book resting in dumps may send flames clear to Mars and he is soliciting prayers requesting God move Mars to a more distant orbit should that happen. He was going to fly the first stage back to GC headquarters for a memorial, but figured, why bother, it will all be burned up anyway. There’s no need to send a book on the spaceship. Just beam a digital copy up to us. Our little bug eyes and green antennas are quivering with anticipation. I HOPE I HAVE A RING SIDE SEAT FOR THE SHOW AND NOT BE IN THE SHOW. Oh, ye of little faith-don’t you know that only haystacks will survive this inferno? It is very sustainable. lWoe iz me!! The haystack recipe has been stolen, for moral reasons, and has been duct tapped to the back cover of the eternal version of GC soon on its way to Mars. It’s calculated to be nourishment for Marshans while they read their free edition of The Great Controversy. Don’t worry. It was close enough for government work. So the GC is studying “how to best utilize offering money to dump landfill loads of tracts and paperbacks on the doorsteps of complete strangers. . . .” Maybe they should try feeding the homeless, clothing the naked, and visiting the prisoners. . . .
Who needs a bakery when the whole world is an oven? Sorry, Hillary; you cannot make an old dog forget his old tricks. Some say that Monicagate shows one reason why we need a woman President. However, if Bill will be living in the White House again, their theory rings hollow. Ha ha. We may not have to worry about Bill. The New York Times has a fascinating analysis and prediction of who will likely be the nominee for each party. It could be Ted Cruz or Marco Rubio. Pill Cosby will be joining Billy Clinton on the campaign trail to stump for Hillary. Both men are such shining examples of fine upstanding gentlemen and respect for women! Yes sir! Bill C. & Bill C. – Bill Clinton and Bill Cosby: like two peas in a pod. Hillary will do well with an endorsement from Cosby. HILARY. I REALLY HOPE YOU DO NOT GET TO BE PRESIDENT. YOU WILL SET A BAD EXAMPLE FOR ALL GOOD AND HONEST PEOPLE.